Don Van Vliet, better known to the music world as Captain Beefheart, has passed away from complications of multiple sclerosis. He was 69 years old. Words like: innovative, influential, original, eccentric, genius, maverick, are words that get thrown around in the press with abandon, like all buzz words do, to describe all manner of people who don’t really fit the bill. In the case of Don Van Vliet, however, they all stick. Together with the Magic Band, Captain Beefheart released 12 albums, including what is generally considered his masterpiece, Trout Mask Replica (1969). which was a radical extension of various musical forms and a departure from all that was going on at the time. Lick my Decals (1970) continued to plow some of the furrows dug up on Trout Mask Replica. My own personal favourite, however, was 1978’s Shiny Beast (Bat Chain Puller); one of my most favourite records of all-time. It’s over 30 years old and still doesn’t sound dated. It was in the late 70s that friends and I discovered Captain Beefheart and the Magic Band, and they really turned our ears around. This is what caught our ear when others were picking up on punk. 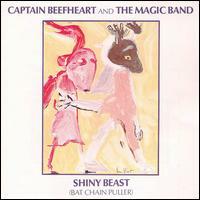 I got my chance to see Captain Beefheart and the Magic Band in 1980/81. They were touring after the release of Doc at the Radar Station (1980). It was in Vancouver, BC at the Commodore Ballroom and we were able to find our way to the front of the stage. In fact, we were literally leaning up against Van Vliet’s monitors, and at one point the good Captain came over to us, leaned down, and very politely and good-naturedly, told us that he had just turned 40 (or was turning 40? ), and that his hearing wasn’t as good as it once was, and the sound of the crowd from up on stage was rather tremendous, so could we please try not to lean on his monitors! During the same concert, there was a drunkard in the back of the hall who kept yelling out inane phrases between songs, like “Rock n’ roll! !” or “Let’s go!” or “Hot Rats.” Beefheart, unimpressed, addressed him as ‘the Format Man.’ After the last song, the band left the stage as the crowd clapped and stomped for an encore. From where we were standing at the front of the stage, we could see Van Vliet sitting in the wings, sitting down, feverishly drawing on a sketch pad. (He kept this sketch pad in a brown paper bag which he kept with him on stage during the show). Later, when the band came back on for an encore, we asked if we could see his drawing, and he obliged. He said it was the Format Man. 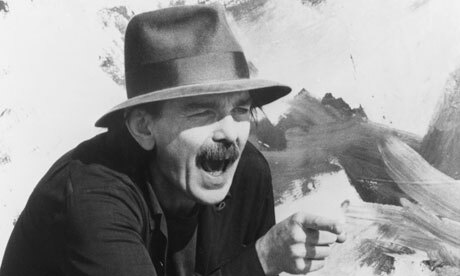 Having had his fill of the music business, Beefheart left music in 1982 and concentrated on a career as a visual artist. We’ll not see the likes of him again, but his legacy will remain. You are currently browsing the archives for the Shiny Beast (Bat Chain Puller) category.